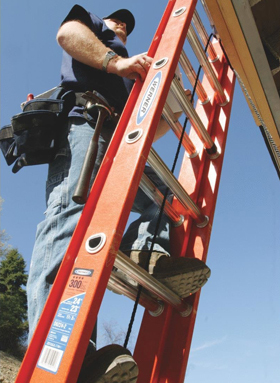 The D6224-2 two section fiberglass extension ladder has non-conductive rails making this ladder ideal for working near electricity. With a duty rating of 300 pounds, the D6224-2 is durable and long lasting. The exclusive ALFLO rung joint means TWIST-PROOF performance on the job. The TRACTION-TRED D rungs are slip resistant and the side rails are interlocking. The dual action feet are for use on hard or penetrable surfaces and swivel easily. 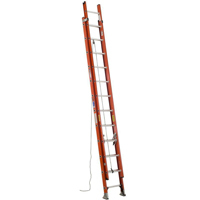 The base and fly sections separate easily to use the base section as a single ladder. The durable rail shield bracket and shoe help protect the bottom of the rail. The fly section rails are pre-pierced at the top for easy field installation of accessories.